The garbage grab crane is the core equipment of garbage feeding system in various municipal solid waste incineration power plants. It is located on the top of the garbage storage pit, mainly responsible for garbage feeding, transportation, mixing, fetching and weighing. A sound responsibility system for safety production should be established. Accurately understand and grasp the performance and characteristics of the equipment, correct operation to ensure the safety of the personal equipment. Safety and technical files should be set up. Crane operators must have good eyesight and hearing, health, crane operation and maintenance and maintenance of crane’s electrical and mechanical equipment. The equipment should have the certificate of the relevant departments, and prohibit the work of the equipment. When the crane runs (including automatic control), the operator shall not leave the post, and find the abnormal situation, and should take appropriate measures in time. 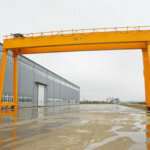 When the crane works, it is forbidden to carry out the repair work such as cleaning, refueling, etc., and prohibit the personnel from staying on the crane. When the relevant personnel must stay, effective safety measures should be taken. After the crane has finished working, the total power supply must be cut off. When the work is stopped for inspection or overhaul, the power supply should be cut off and a striking warning sign should be suspended. 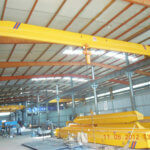 The maintenance tools and spare parts must be stored in a special cabinet and are forbidden to be placed on the crane. When overhauling, a portable light with a voltage below 36V must be used. It is forbidden to carry or lift personnel with a grab. It is forbidden to store inflammable (such as kerosene), explosive and toxic substances on the crane. When the crane is running, avoid scraping and scraping the garbage, wall, hopper, etc. 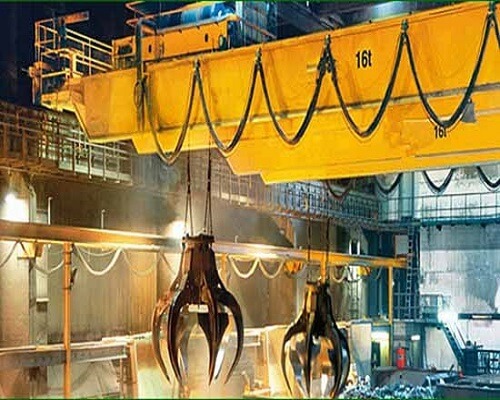 to prevent the hoist from rotating and colliding. During the work of the crane operator, it cannot drink, so as to ensure the concentration of spirit and sober mind. 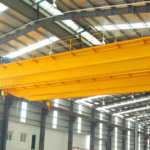 The operator should be familiar with the use, operation rules, operation methods and maintenance knowledge of the crane. Strictly abide by safety rules, operating rules and maintenance rules. 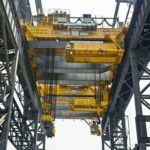 Before the main switch is connected, all the controllers must be in a “zero position” to check the crane’s condition. The crane at each start before should be issued a warning signal (bell). When driving, no matter manual or automatic operation, operators must concentrate on the operation direction, speed, and location of the grab and the twist and swing of the grab, and pay attention to the sound of the equipment, especially the electrical equipment. Special attention: the reliability of the brake, the stability of the control, the reliability of the limit switch, and so on. The lifting of the weight must be in a vertical position. It is not allowed to use large cars and trolley to drag heavy objects. The crane should move closer to the edge at the slowest speed. When working normally, the limit switch is prohibited as a means of normal parking. The controller of the crane should be progressively started in the mechanical stop before the ban, the controller from an anti-clockwise position directly to reverse the position of the brake, but as in the case of exceptions to prevent accidents. 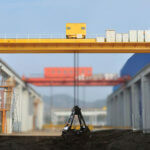 The operator should prevent the collision between the crane and the other crane. No crane can be used to move another crane. When the crane’s motor is suddenly blackout or the voltage drops sharply, all the controllers should be pulled back to the zero position as soon as possible; the total switch must be cut off. The driver should check the crane in each class. Do the handover class well (fill in the “record list of the handover class”). The total power supply of the lamp in the cabinet: the protection switch =02-F30 for all the lighting in the cabinet. When the cabinet needs lighting, the protection switch in the closet is -F39, and the light is lighted when the door is opened. The total power of the bridge lighting is: the protection switch =02-F31, when the bridge lights are closed, the -F31 is turned off, then the =02-S23 “bridge lights” switch (the left side box) is connected, and the illumination lamp on the bridge is bright. The total power supply of the power outlet on the crane: the protection switch =02-F32-F35, and the 220 power supply in the socket after closure can be used. The =02-F33 is closed when the 36V power is needed. Note: the PLC of the electrical system should be supplied for a long time. There is no need to disable the electricity. When the power goes out, the PLC power should be disconnected first, then the power switch of other institutions should be disconnected. The =04-F39 is closed when the cabinet needs to be illuminated, and the light is lighted when the door is opened. Closed protection switch =05-F39 when the cabinet is required to be illuminated, and the light is lighted when the door is opened. Closed power control circuit breaker =10-F31. Closed power control circuit breaker =12-F31. The Switch 10-F39 is closed when the cabinet needs to be illuminated, and the light is lighted when the door is opened. Close the power supply of the weighing device, open the computer, and make it into the normal working state. Open the =01-F35 circuit breaker in the A11 cabinet and supply the power for PLC, touch screen, and limit switch. Turn the key switch =01-S22 and connect the power supply to the distribution protection screen. Observe whether the controller’s controller’s handle is in the “zero position” (the handle must be in zero position). Press the total power start button =01-S11. The starting order of the above three mechanisms is interchangeable. PLC, frequency converter starting to need program self-inspection, its fan starting is relatively slow. After the converter is not fully activated, the starting mechanism is unfavorable to the frequency converter, so it should be operated for a period of time (about 10 seconds) at the frequency converter. The failure of the system may cause failure to display the system. Use the handle of the left box to complete the left and right driving of the cart and the front and back of the car; operate the handle of the right box to complete the lifting and opening and closing of the grab. The stalls of the three main controllers of the lifting, large and small cars are all 3-0-3, and the direction is symmetrical. The first gear is a low-speed gear, which is set up for the accurate parking. The normal operation should not use the low-speed gear for a long time. Because frequent movement, especially in positive and negative directions, will reduce the service life of the equipment. Therefore, operators should master and make full use of the performance of this crane, operate the control handle accurately and smoothly, reduce or do not use point operation, and control the swing of lifting the load. Fast and frequent locations are prohibited from moving or reversing the handle. Parking: the crane will be shut down for a long time or need to be overhauled. 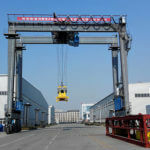 All the power supply of the crane should be cut off, and all kinds of circuit breakers should be restored to the disconnected position (including the user’s main circuit breaker). The power control handle in order: “zero”; the mechanism stops running, press the stop button K0 power off, turn the key switch off the control power, disconnect the Q0 after breaking F34 breaker. When necessary, disconnect the power supply of all air and A14, A13, A12 weighing device, A11 control cabinet. Temporary parking: if the crane takes a long time to stop running (such as shift), in order to prevent the misoperation of non operating personnel, disconnect the main contractor, the method is as follows: in the control handle to zero, the mechanism stops after the operation, the total power stop button, =01 – K0 the power loss of power crane disconnect other there is no need to open the power supply. Before starting again, the “handle must return to zero”, otherwise PLC alarm and no operation instructions, the agencies can not work. Emergency: Crane with the danger of failure, such as a control handle, a limit switch (especially the lifting mechanism for motor speed limit) failure, etc., in order to prevent accidents or reduce accidents, in need of emergency cut off the power, control power supply, according to the linkage table red mushroom head “the total power emergency stop” button (the button only clockwise to recover), =01-Q0 tripping open. 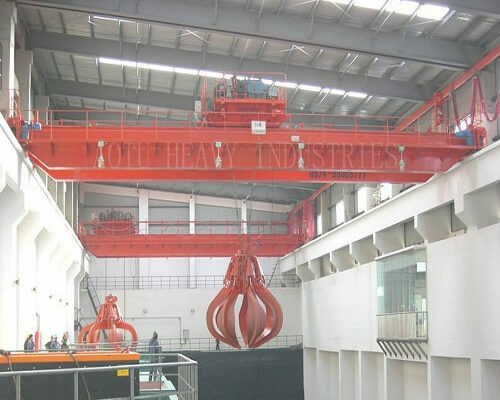 The power supply of each mechanism of the crane, the disconnection of the control power supply and the brake power break of the brake. It is forbidden to use this button in normal parking. The emergency stop button is moved only with clockwise rotation to recover. If the fault is disconnected from other power supply, it should be reopened and started again according to the “drive” process mentioned above. Such as troubleshooting without disconnecting the circuit breaker and other protection switch, only in the A11 cabinet will handle the first drop on =01-Q0 circuit breaker contact mechanism, and then move the handle to open the closed, starting power supply contactor and then press “start” process and the total power supply contactor control cabinet, the crane can work normally. The spatial position of the crane grab is detected by the corner encoder, and the position encoder of the lifting mechanism is located at the end of the wire rope reel. The encoder of the large car mechanism is located on the 50 (operating room side) end beam from the motor train wheel shaft. The encoder of the car is located on the driven wheel of the 60 (crane car). When the wheel (wire rope drum) rotates, the encoder sends out the corner signal. After counting and converting the PLC counting module, PLC can accurately understand the running distance of the grab. Then the original point of the coordinate is sent to PLC accurately, and PLC can understand the spatial position of the grab. 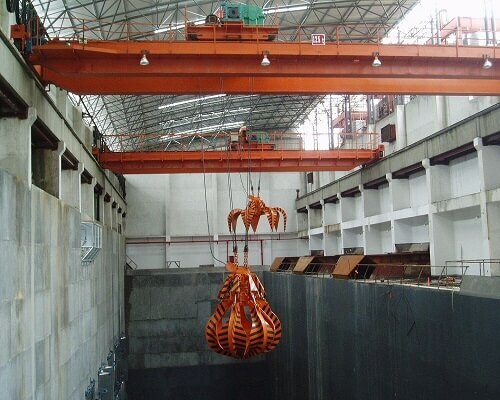 Because it is indirect detection, the diameter of the wheel, the straightness of the track, the elastic deformation of the wire rope and so on will accumulate in the counting module, so that PLC cannot accurately understand the actual position of the grab. For this purpose, the travel switch is arranged in the operation line setting position of the lifting mechanism, the cart operation mechanism and the car running mechanism. When the mechanism passes through the travel switch, the original location is sent back to PLC to eliminate the error caused by the above factors, that is, clearing the zero. The zero stroke switch of lifting mechanism is the “upper limit” travel switch of the lifting mechanism. The zero stroke switch of a cart is the “B switch center of the cart” travel switch. The car’s zero stroke switch is the “car position clearing” switch of the central location of the garbage pool. When the mechanism passes through the above switch, the encoder implants the fixed data that is zero. The above 3 stroke switches are the support switches of the crane’s automatic operation, which must be effective, otherwise, the automatic operation cannot be carried out. For the first time (when the electricity is cut off again), a three dimensional system calibration (clearing) is necessary. When working normally, if an organization has no chance to reach the zero stroke switch for a long time, it should be calibrated every once in a while.